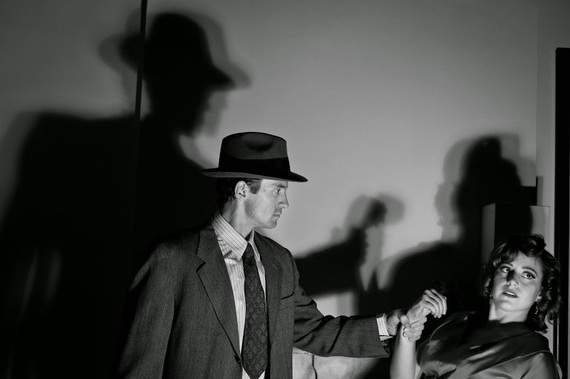 Sendups are always tricky -- but the film noir parody Kill Me Like You Mean It, now off-Broadway at the Fourth Street Theatre, riffs on the genre with existential glee. Playwright Kiran Rikhye plays with the conceits of the hard-boiled genre -- lone detectives with a singular morality, femme fatales with enough curves to drive men wild and laconic dialogue -- to great effect. Plus, director Stancato deftly recreates a cinematic experience by having the audience witness different points of view in the same room. Ace PI Ben Farrell (Nathan Darrow) has been hired to solve two cases. First, he's hired by the clipped-speaking, no-nonsense blonde Lydia Forsythe (Natalie Hegg), then by sassy brunette Vivian Ballantine (an excellent Sarah Skeist, who can pull off the outfits and the dialogue.) Both are interested in pulp fiction writer Tommy Dickie (David Skeist). But here's the twist: The crime stories Dickie pens have a strange way of coming true. Now the over-the-top pulp writer has put a fictional detective, who bears a striking resemblance to Farrell, in his literary crosshairs. What's tall, dark and angry suppose to do? Or as Ballantine so succinctly puts it: "I love your scruples because they mean so little." Solving the case means diving headfirst into every detective cliché, while, at the same time, facing key questions about life and death. The power of any good spoof is that it zings the conventions, while revealing its cultural allure. Kill Me, which mines the terrain for its deeper meaning, is shooting on all cylinders, replete with enough murderous impulses and plot twists to satisfy Sam Spade. References to classic movies, such as Laura (the campy bathtub tribute to Waldo Lydecker is a gem) and The Maltese Falcon, abound. So do the design elements -- a half-scene neon hotel sign through Venetian blinds sets the stage for a roller-coaster ride where life imitates art -- with a few slaps and slugs en route to seal the deal. A terrific cast, period-perfect lighting and costumes ensures Kill Me If You Can is an entertaining romp. And its shtick with cigarettes, a detective mainstay, is a neat bit of comic business. The latest production of Stolen Chair, the innovative theater troupe that scored an artistic triumph with The Man Who Laughs is a clever stage noir full of surprises. As Churchill, now at New World Stages notes, Winston Churchill proved he still had the power to surprise once he left office. One of the greatest world leaders, Churchill had a storied career -- as a journalist, writer, Member of Parliament and Chancellor of the Exchequer. But it was as a wartime prime minister that he left his mark on history. Yet Britain rejected him in peacetime. Voted out of office in July 1945, shortly after VE Day, he left the post he had coveted for decades. Churchill begins his post-war journey. Invited by President Truman in 1946 to speak at Westminster College in Missouri, the great man coined the phrase "The Iron Curtain" to describe the new landscape of Central and Eastern Europe under Soviet influence. But the occasion also gives Ronald Keaton, who does an admirable job capturing a more human, sensitive Churchill in his solo performance, a chance to recount his life. The play introduces a thoughtful, resolute statesman who grapples with a lonely childhood and aristocratic but remote parents. Depression ("the black dog"), war and his years in the political wilderness are discussed. Whether it's his devotion to his beloved Clementine, FDR, the horrors of Hitler or the contempt he held for Nazi appeasers, be it Neville Chamberlain or Joseph Kennedy, Churchill is never less than eloquent and determined. But the man who believed he was "walking with destiny" comes across as both vulnerable and lucky. From his barely squeaking into Sandhurst, the prestigious military school that trains British Army officers, to his tenure as First Lord of the Admiralty overseeing the disastrous Gallipoli Campaign, Churchill, as channeled by Keaton, emerges as an engaging, pragmatic figure whose devotion to service is pronounced. Churchill not only commanded a battalion in World War I, but helped draft the first unemployment pension legislation. His was not a world of spin, but of principle. While some of his more questionable political positions -- his stance on Gandhi or his uneasy relationship with fascist dictators in the 1930s -- are not addressed, the sheer gravitas of the man is impressive. His command of English -- and the ability to deliver stirring speeches he wrote himself -- is unmatched. Next to Churchill, today's politicians look puny. Whether in or out of political favor, Churchill is a fascinating, always provocative figure. And Keaton, well directed by Kurt Johns, is adept at capturing his gait, mannerisms and singular charm. Churchill's story doubles as entertaining and educative theater. He had many accomplishments, and several tragic failures, but his leadership during the world's greatest crisis was unparalleled. Churchill never failed to inspire -- and Keaton's excellent rendition explains why.